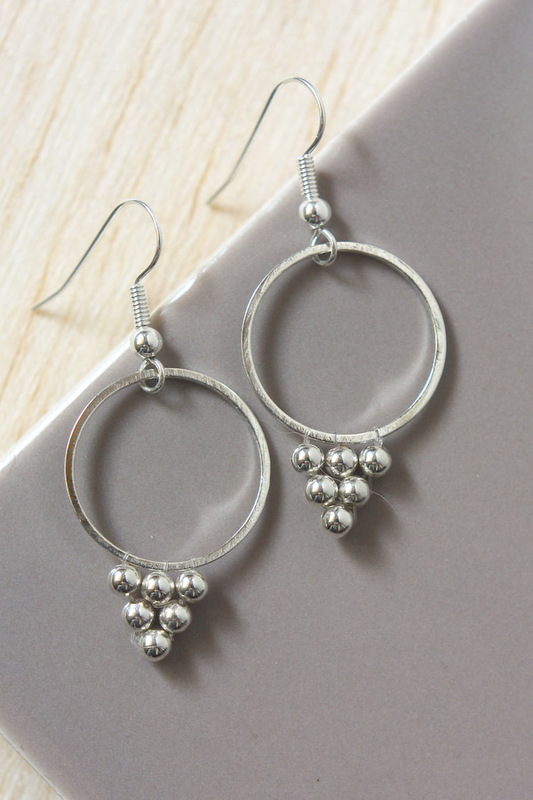 Make these stylishly minimal silver bead earrings using a solid ring and metal beads. I was inspired by a lot of thorn and sharks tooth designs I have seen lately, and wanted to create something of a similar shape using beads. This simple but effective necklace and earring set is based on a the chainmaille technique of the mobius knot. Jump rings are linked together to look like a knot or rosette. The mobius knot is a simple (if slightly fiddly) technique using jump rings connected together to make a knot or rose type design. Two points to mention 1. if you don’t know how to open and close jump rings pop on over to my tutorial to learn 2. Jump rings from different suppliers might not work in the same way, due to the terribly complex sounding ‘aspect ratio’. All this means is that jump rings can be made from different thicknesses, or gauges’ of wire, even if they are the same outer diameter. Its not a problem, you just may have to add another or take away a ring if the design isn’t sitting nicely.